In some areas where tailings dam construction is difficult (e.g. mountainous areas), mining companies have been allowed to dispose of tailings in river systems. In some coastal areas, submarine disposal has also been permitted. These methods are generally considered to be an undesirable option for waste management and are not permitted in many countries, including Canada and Australia. Although initially cost-effective, the documented environmental impacts and the potential for long-term effects have prompted some companies to develop internal standards that prevent riverine or marine disposal. 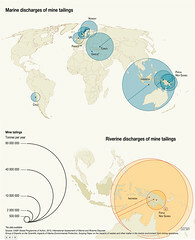 The graphic shows the locations of mines carrying out marine and riverine tailings discharge in 2012. 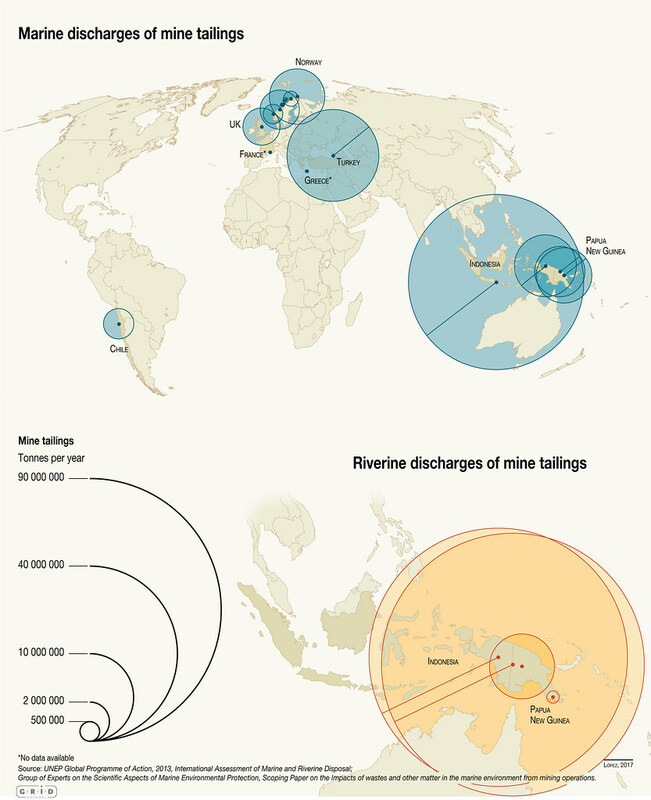 All of these mines have government permits to discharge into the ocean or rivers. One emerging issue relates to deep-sea mineral extraction, where marine waste disposal of fine material – but not strictly tailings unless processing takes place at sea, which is unlikely – is the only option. Deep-ocean ores are often much higher grade than their on-land counterparts, making them attractive in terms of the value of the ore, however, they remain unproven with concerns over financial viability. Scientists and communities have voiced concerns over the mining process and the on-site disposal of waste material, which may cause significant environmental impact due to increased turbidity and the blanketing of sea-floor organisms with fine material.